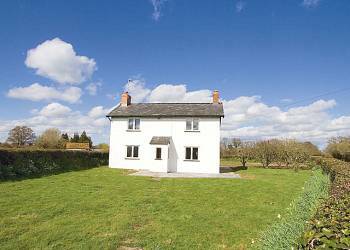 Hawk Cottage is a pretty little two bedroom cottage situated in the countryside near Ilminster, which is 8 miles from Taunton in Somerset. As can be seen from the photo the cottage has a very beautiful lawned garden, which surrounds the house. Inside the cottage is comfortably furnished. The lounge consists of a sofa and armchair with woodburner stove (free logs). There is also a TV and DVD player for entertainment. In addition there is a separate dining room with an open fire and a fully equipped kitchen which includes a dishwasher and washing machine. The bedrooms are upstairs: a double room with a 5 foot bed and a twin room. Outside the cottage also benefits from a barbeque and parking. The owners allow pets (one dog max).